SSA Stores Blog - Free online custom apparel stores! School spirit is an important part of a student’s school experience. Spirit days help to break up the monotony of everyday school life and it’s a chance for students to come together to show their pride in their school. Here are some school spirit ideas that will encourage involvement and create a sense of community. Dress up days are a fun way to get creative! Designate a different theme for each day of your spirit week. You could have days like crazy hair day, western day, pajama day, Hawaiian day, twin day, etc. You could award small prizes to the best outfit each day to encourage participation. Ask students to create posters to display in the school hallways and gym. This school spirit idea is another one that could have a prize awarded to the favorite poster designer. While pep rallies typically are held to support a basketball or football team, there is no reason you can’t look for more excuses to have one! You could have a holiday-themed pep rally or have one to celebrate the beginning or end of the school year. 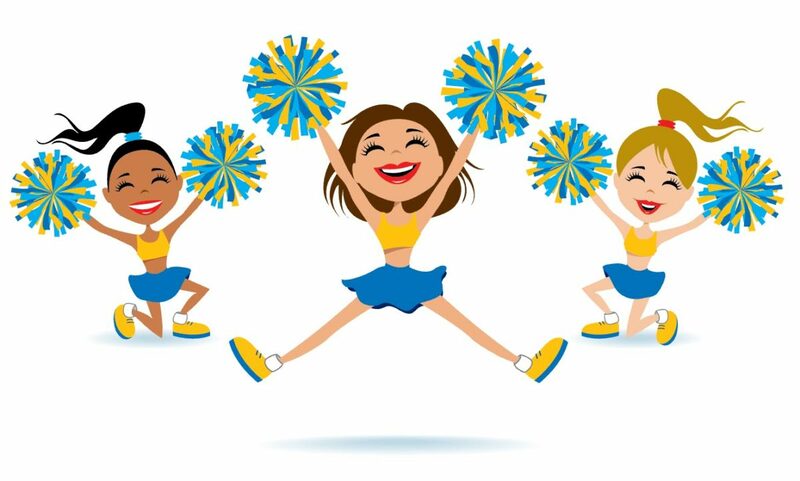 Get your cheerleaders, marching band, and/or dance team involved to get people on their feet and cheering! Make sure that students have time to plan and encourage them to wear your school colors or paint their faces. Consider incorporating games and competitions to increase student and faculty involvement. Traditions are a great way to get people engaged. Here are a few examples of school traditions that are sure to be a hit! Your school dance doesn’t have to be a huge formal affair. Having some fun, casual dances periodically might be less intimidating to some students. Choose a theme and get students involved in the preparation. You can have them make posters to advertise the dance and help make decorations for the big night. Make sure you recruit an adequate number of chaperones to have on hand during the dance. This can be a really fun way to get students interacting with staff in an enjoyable environment. You could have a flag football, basketball, or softball game. You could also go for an obstacle course. Finish up the game with a pizza party! Plan out some fun lunchtime activities during spirit week. You can also consider charging a small amount to play each game. Here are some lunchtime activity ideas. Talent shows are an excellent way to allow students to display their special gifts. You will need to decide if you’d like this to be a free event or charge for entrance tickets. You will also need to choose if you’d like there to be winners chosen at the end. If you do want to have winners, then you will need to assign judges and pick what criteria you want for them to choose from. 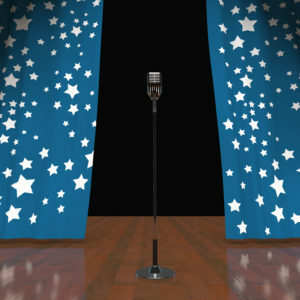 For more helpful tips on setting up your talent show check out this WikiHow post. What better way to bring students together than by helping the community? Volunteering is also a great way to boost self-esteem. There are endless opportunities! Here are some community service ideas. Volunteer at a soup kitchen or local Meals on Wheels usually need some help with dishes etc. School spirit wear is a great way to show school spirit! This can be done in conjunction with any of the school spirit ideas listed above. Creating a unified look with high school apparel can be a great way to boost school spirit! Your school will also earn money back from every sale made in your free online school spirit wear store. Check out this post for more tips on High School Apparel for School Spirit. If you’ve been assigned the job of starting a fundraiser for your organization, it can seem overwhelming at first. 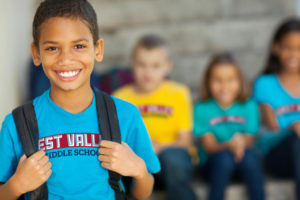 Fundraising for your school, team, church, or club is a great way to raise money! Here are some tips on how to start a fundraiser. First, you will want to determine how much money you are trying raise and set a goal. Are you trying to raise money for uniforms? How much will it cost to outfit your team? You will also want to keep in mind any upfront costs for your fundraiser. If you are running a raffle fundraiser and can’t secure enough donations for prizes where will the money come from to pay for them? If you plan for these things ahead of time you can avoid disappointment. You will need to make sure you have enough help on hand for your fundraiser. You will need to find reliable volunteers so you can be assured that you won’t end up trying to do everything yourself. Depending on what type of fundraiser you choose, you can recruit other parents, teachers, coaches, or students and teammates. Remember that in addition to the volunteers you’ll need to perform the duties specific to your fundraiser, you’ll also need someone to oversee the money and someone to promote your fundraiser. Make sure that you provide your volunteers with the appropriate equipment that they will need for their task and they have been given proper guidance. 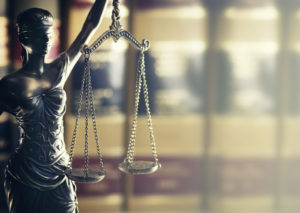 Make sure you research the legalities of the type of fundraiser you decide to run. You will also want to speak with someone regarding tax deductibility. You may be required to provide acknowledgment letters to donors. The best way to make sure that you have your bases covered is to speak with a professional. Now to decide what type of fundraiser you’d like to do. We have a post full of fundraising ideas and also one with some fundraising event options. We will go over different types of fundraisers. Fundraising events are a great way to get everyone together for a fun time while raising money. Some different types of fundraising events are raffles, bake sales, auctions, car wash, pancake feed, and a carnival night. These all involve extensive planning and organization. For most of these, you will need to secure a location large enough to hold your event. Many of these also involve getting adequate donations for prizes (raffle, auction, etc). For more tips on fundraising events check out this post. 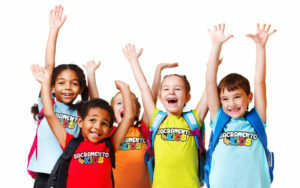 Fundraising sales will usually allow you to get kids more involved in the fundraiser. With so many options to choose from like chocolate bar fundraisers, wrapping paper sales, cookie dough fundraisers, Krispy Kreme fundraiser, coupon books, etc, it can be overwhelming to choose which one is right for your organization. You will want to carefully review each product to determine not only which one you think will be most appealing to your audience but also which one offers the most percentage of return on sales. There are many different types of online fundraisers. You could go with a crowdfunding option like a Go Fund Me fundraiser and just flat out ask people to donate to your organization. If you are fundraising for a charitable organization, you can sign up for Amazon Smile. Amazon also has an affiliate program if you have a website. Facebook has a fundraising option which is great if the majority of your potential donors use the social media sharing site. One of the most simple online fundraisers is the tshirt fundraiser. This works so well because it’s really easy to set up and your donors receive something in return. Your store will be offering more than just shirts though! There is a wide selection of custom apparel and accessories that will have your logo on them. It’s free to set up your online store and it just takes a few minutes. We offer built-in promoting tools to make sure that you maximize your fundraiser! We want to make sure that your tshirt fundraiser is a success! If you need any help setting up your store please don’t hesitate to reach out to us! Getting a group together for an event is a great way to raise money for your organization. 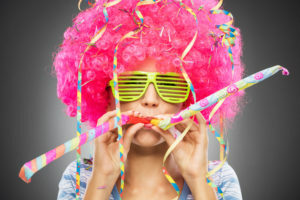 There are a lot of different types of fundraising events that you can do that are fun for everyone! 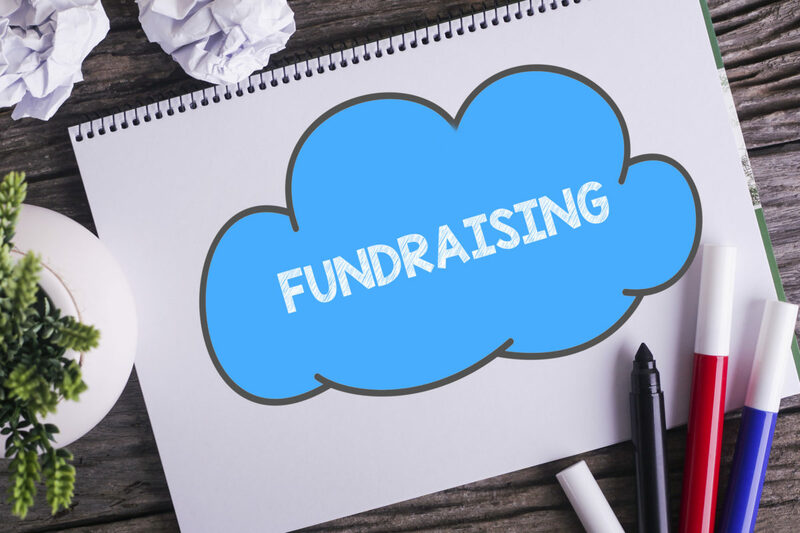 Here are some different types of fundraisers that are perfect for schools, teams, churches, clubs, and more. 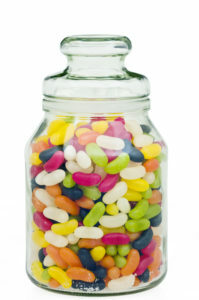 Jellybean Count- Have a jar of jellybeans or something else that might be relevant to your organization on display. Participants will pay a set amount to guess how many are in the jar. The winner will get a prize or the contents of the jar. Heads or Tails- Each person can purchase a ticket upon entrance to your fundraising event to participate. The person who is leading will ask the participants to stand and then choose heads or tails. They can indicate their choice by raising their hand or a card. The announcer will then flip a coin and the winners will remain standing. This will continue until only one person is left standing. That person will win a prize. Cake Walk- For this game, you will need to collect donated cakes and then sell tickets to participate in the cake walk. You will set up a circle of numbered squares and the participants will start walking around the squares as music plays. When the music stops the organizer will draw a number and whoever is standing on the corresponding number will win a cake! Balloon Pop- You will blow up balloons and place tickets inside of them. To ensure that all the balloons look the same make sure that even if it’s not a winner you can write something on the ticket like “Thanks for playing!”. The winners will receive the prize written on their ticket. Have an assortment of donated prizes for your winners. Banned Word Jar- Determine a commonly used word that will be banned during your fundraising event. It can be something that can correlate to your organization. For example, if you are having a baseball fundraiser you could ban the word ball. Anytime someone uses the word they will put $1 (or whatever price you have determined) into the jar. You can raise even more money by setting a higher amount, like $20, for your guests to be able to unban and change the banned word. 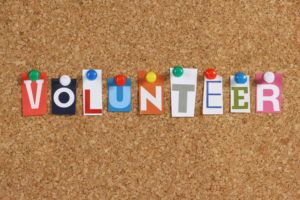 Volunteers– Find out how many people are interested in volunteering. The more the merrier! Keep in mind that you will need more than just car washers. You will need people to collect the money, dry the cars, and volunteers to hold signs as well. Location– If your organization has a location on a busy intersection then you’re in luck! If not, you have a couple of options. Have people holding signs on nearby busy streets and direct them to your location. If you don’t have a physical location or don’t have one that will work, you will need to find one. Ask permission from a local business preferably one in a high-traffic area. 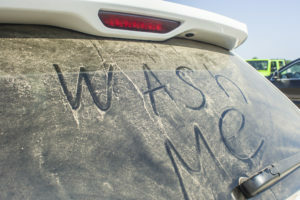 When– Decide on an appropriate date for your car wash. You will want to try to choose a day that will be nice and hot! Ideally, a Saturday will be the most popular time to get customers. Price– You will need to decide how much you want to charge. You can choose a set price or simply ask for donations. 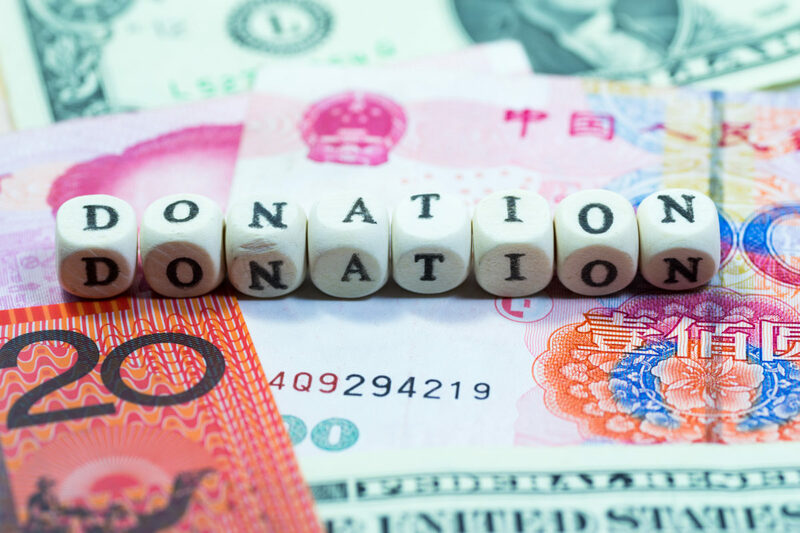 Often times the donation strategy will actually generate more money than a set price. Signage– It’s time to get crafty and create some eye-catching signs to promote your car wash fundraiser! As stated above, have volunteers stand on high-traffic intersections near your car wash location. Car Wash Time! – On the big day make sure that all your volunteers know their job duty. Also, ensure that you have plenty of the proper supplies on hand. Don’t forget to thank your customers and have some fun! Choose a Date– If possible choose a day where there will already be a lot of potential customers at your location. For example, if you are doing a church fundraiser you could plan your breakfast after service Sunday. Advertise– Put up posters around your venue. You could send out an email to those involved with your organization. If you have a weekly bulletin that goes out don’t forget to include it in that. Volunteers– You will need at least 5 different types of volunteers: Set up, Cooks, Servers, Clean up, and Cashier. How many of each type you need will depend on how big your event will be. Food– The most important part! You will need to decide on your menu first. Obviously pancakes but you’ll want to consider offering bacon or sausage as well. You will need to plan on beverages like coffee and orange juice. Don’t forget the syrup and butter. Plan on offering some sugar-free butter as well. You can ask supporters or local grocery stores to donate the food. 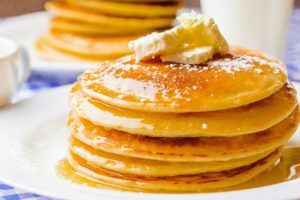 Krusteaz also has a fundraising program where they will reimburse you for a portion back of their pancake mix cost. Other Supplies: You will need to have plenty of tables and chairs set up. Get the paper plates, plastic silverware, and napkins donated. Set Up Your Free Store– Setting up your store is easy and just takes a few minutes! You can upload your logo or Apparel Now will be happy to help you with your artwork. You can select the colors that you’d like for your designs as well as what type of apparel you’d like to offer in your store. 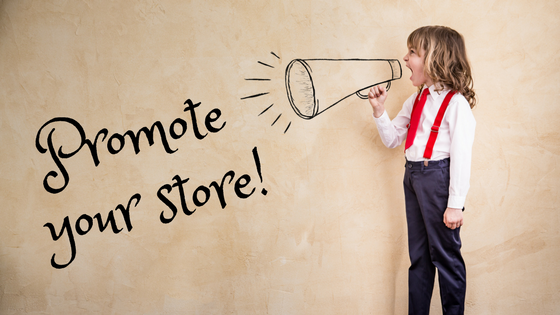 Promote– Now you can get the word out about your new store! The dashboard of your store will contain tools to make it easy to share. You can quickly share via social networks, get your stores URL, and find banners to place on your website or blog. We have a detailed post with in-depth tips on promoting your store. Get Money! – Now you can sit back and let us do the work for you! Apparel Now will collect the money, process the orders, and ship them out! You will receive a percentage back for all of the sales made in the store. Fundraising doesn’t have to be a pain! Our goal is to help you earn as much money for your organization with the least amount of burden for you! Fundraising is a great way to get other supporters involved in your cause. 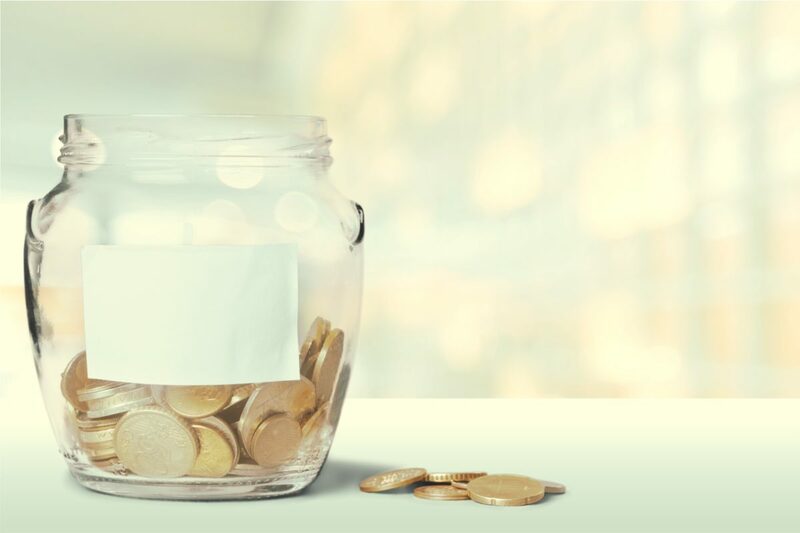 Whether it’s for a school, church, team, club, or other organization there are plenty of options that you can choose from when you are planning to start a fundraiser. Here are some of the most popular fundraising ideas. 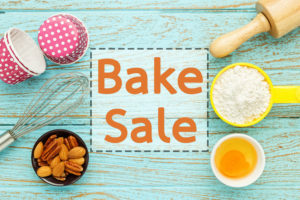 One of the most popular fundraising events is the bake sale. Everyone is familiar with them, so they are fairly easy to set up. Bake sales have a low cost to set up and who doesn’t love sweets! This type of fundraiser is a great way to get a lot of other people involved. It’s also a great way to meet other parents and participate in a fun event together. You will want to make sure that you choose reliable volunteers so that you don’t end standing at an empty table or worse end up with a bunch of store-bought stuff! The point of a bake sale is to get special homemade goodies so make sure you round up the right folks. If you don’t have a lot of volunteers for baking, you can always go with a Krispy Kreme Fundraiser. You can choose to sell boxes of donuts or you can offer gift cards, so your customer can buy the donuts on their own schedule. You can also sell coffee or BOGO cards. 50/50 raffle- You will sell only 50 tickets for a set price each. The winner will get 50% of the total money collected. Another spin on this is to sell 50 tickets for a high price like $50 each. The winner will get a high-ticket item that has hopefully been donated to you. The low number of tickets sold increases the chances of winning to encourage people to be willing to spend more on a single ticket. You can sell raffle tickets and have specific baskets for your customers to chose to enter their tickets in. Group together similar donations for the baskets. Draw one winner for each basket. This is an incentive for people to purchase tickets because they will only be entering to win items that they want. Are you seeing a trend here? Sweets sell! 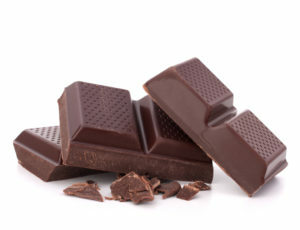 Shop around and find the best fundraising candy bars to suit your needs. Involve your kids and take them on a supervised visit around the neighborhood and to family members and friends homes to make some sales. The best way to sell a lot of chocolate is to bring it with you to work. Spread the word to your coworkers and when the 10 am and 3 pm snacking urge hits you’ll sell out in a flash! Make sure to keep careful track of how many you have sold. Running a carwash is one of the least expensive fundraising ideas. It will require some planning though. You need a high traffic location (that you have approval to use), a few volunteers, carwash supplies, and hopefully some sunshine! Oh, and don’t forget to make a lot of eye-catching signs! You can charge a set price for the carwash or just ask for donations. Often times the free carwash will generate more money than one with a set price. This one can be a little more labor intensive. Especially if you don’t have the images that you’d like to use for your calendar ready to go. If you don’t you will need to plan out when images you’d like on your calendar and then find a photographer to take them for you. 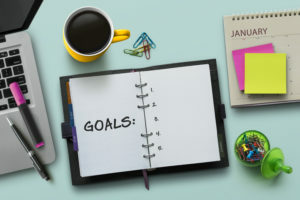 Once you have your images and the layout of your calendars arranged you can decide if you’d also like to sell advertising space on your fundraising calendar. This can generate more money for you, but keep in mind that it will also require extra work on your part to organize the advertising. One of the most simple fundraising ideas is sometimes called a “t shirt fundraiser” but really Apparel Now offers a wide range of custom apparel options. One of the things that makes this such a great fundraising option is that the strain is taken off of the organizer. Instead of rounding up volunteers, order forms, cookies, and money, Apparel Now takes care of it all! To get started you will just need to set up your free online store. You can upload your logo or Apparel Now will be happy to assist you with your artwork. You can select the colors that you’d like for your designs as well as what type of apparel you’d like to offer in your store. Next, you’ll just need to get the word out about your new store! 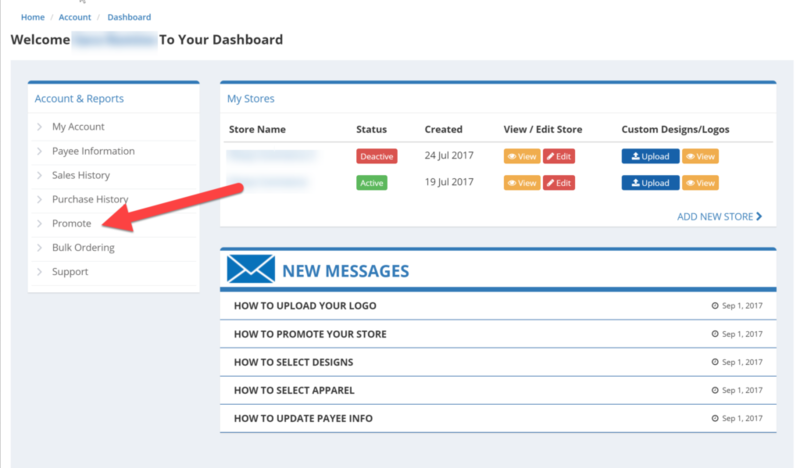 The dashboard of your new store will contain tools to make it easy to share. 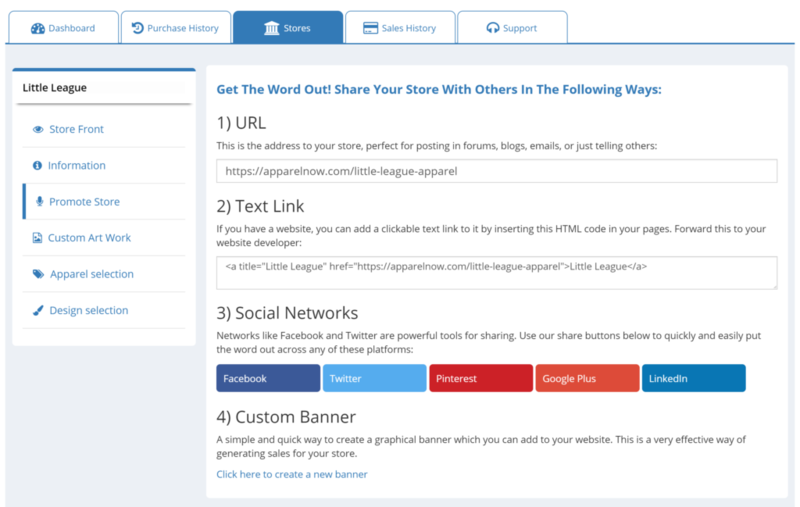 You can quickly share via social networks, get your stores URL, and also find banners to place on your website or blog. We have a detailed post with in-depth tips on promoting your store. Your customers will place their orders in the online store. Apparel Now will collect the money, process the orders, and ship them out! You will receive a percentage back from all of the sales made in the store and your customers will get some cool custom apparel with your logo on it! Fundraising doesn’t have to be a pain. Our goal is to help you earn as much money for your organization with the least amount of effort from you! There are many benefits to having your children involved in sports. Participation in sports can help develop values that will have a positive impact for their whole life. Here are some of the benefits of having your kids in sports. Physical activity is an important part of making sure that your child is developing healthy habits. 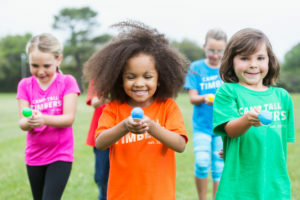 Starting healthy fitness habits when your kids are young will help them carry on a healthy lifestyle as they get older. Exercise is also a great stress reliever! Getting your kids away from TV, computers, and video games is an added bonus! Without self-discipline, it would be difficult to excel in sports. Your child will learn to follow rules, abide by the referee’s decision, and take orders from the coach. Good discipline will help your child reach their goals both on and off the field. Another benefit of having your kids in sports is growing their self-confidence. Receiving praise from the coach or a teammate is a great confidence boost! 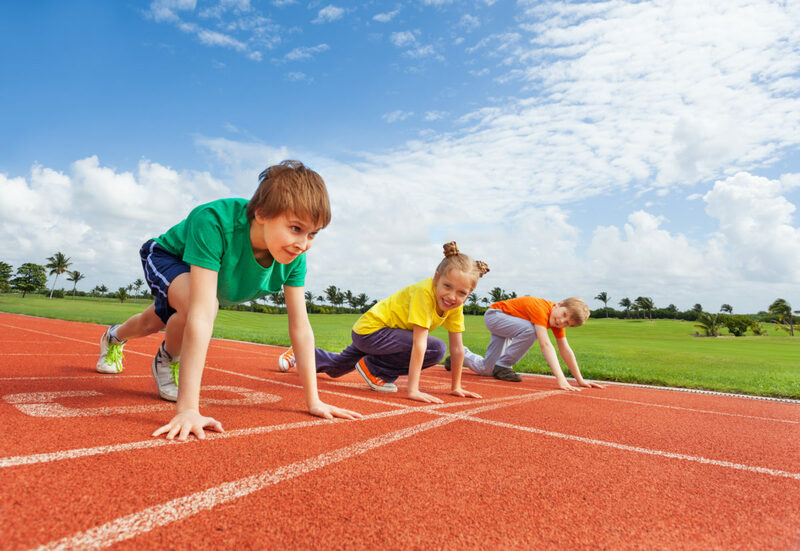 Setting a goal and achieving it whether they win or lose will increase your child’s self-esteem. Just make sure that you always are using constructive criticism to avoid discouraging your kids. Working together as a team is a fantastic way for your child to learn problem-solving skills and good communication. It’s also an opportunity to build close friendships and attain a sense of belonging. Teaching your child to be a humble winner and a gracious loser is one of the most important lessons. There is no harm in being competitive, but how they handle the outcome is what matters the most. Learning to cope with defeat is a valuable lesson. 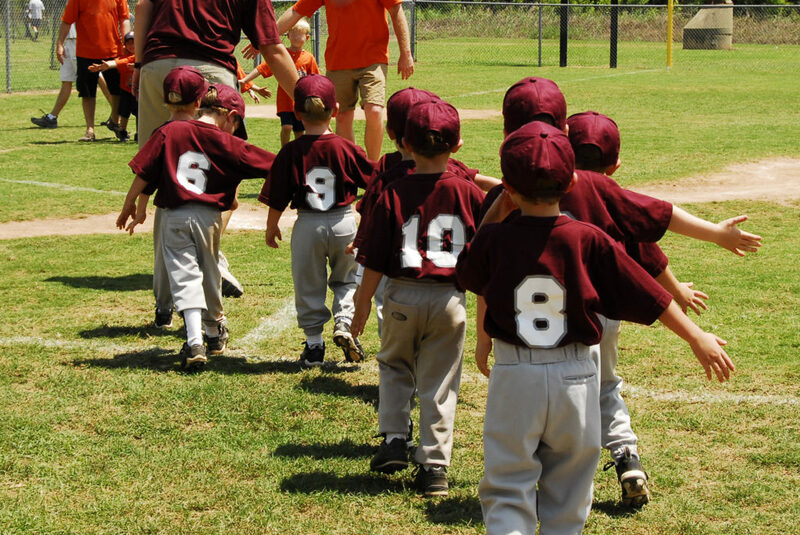 Having your child involved in sports is a great decision for the whole family! Getting everyone together to cheer on the team is a great chance for bonding. 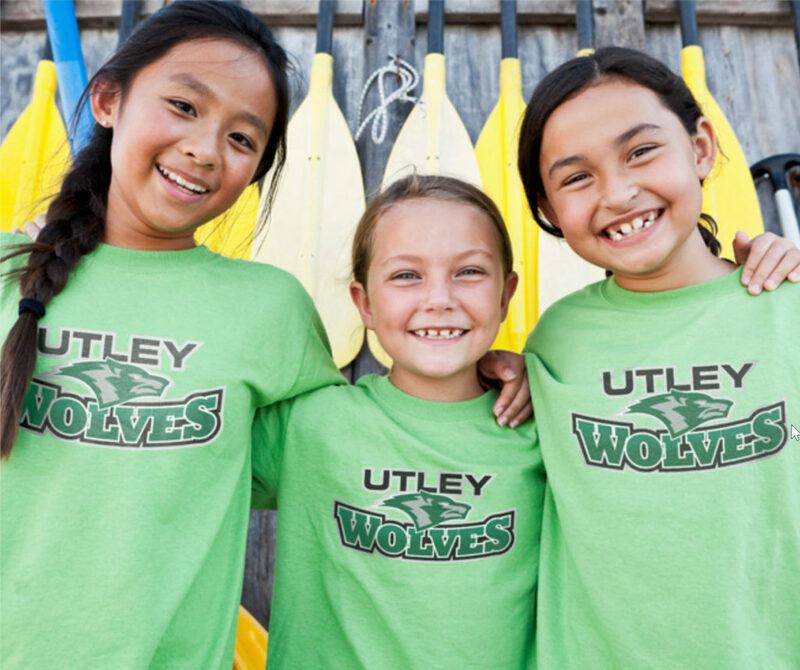 Show your support for your kid’s team with some custom sports apparel! The discipline your child learns from playing sports will transfer over to their schoolwork. Not only that, but studies show the physical activity improves concentration. As your child gets older there will likely be a minimum GPA required for them to be eligible to play their sport. Losing is hard. It’s in our nature to want to be the best. Starting at very young age children can exhibit exactly how much they hate losing. Whether it be losing to a sibling, daycare friend, or classmate. An innocent game of Duck, Duck, Goose can result in multiple tantrum throwers. It’s disappointing when the object of the game is to win and they feel like they fell short. Losing gracefully is a hard lesson to learn, but showing your kids how to accept defeat will make the game more enjoyable for them without the constant fear of disappointment. On the flip side, the gloating and the “In your face!” attitude isn’t any better. It’s important to find a healthy balance no matter whether they are the winner or the loser. Here are some tips that you can share with your kids to make sure that your child can experience the joy of being part of a team while also being a good sport. If you’re great at what you do people will notice. Don’t gloat to your teammates or to the other team. It’s important to be a good sport and be humble while accepting praise graciously. There is nothing wrong with being great at what you do. Just don’t make others feel bad about their skill level. Even if you don’t agree with the coaches decision it’s important to follow their instruction and wait until after the game to discuss it with them privately. Arguing during the game isn’t going to solve anything and will just be disruptive. Make sure that you know all of the rules of the game by attending every practice and being actively involved. It’s the player’s responsibility to know all of the rules which will make it much more enjoyable and will also allow you to play a smoother game. Even if you are the greatest player on the team sometimes you may have to sit on the bench. Being a good sport means that you don’t pout when it’s your turn to sit out. Instead, use this opportunity to cheer on your teammates that are playing the game. If you make a mistake learn from it and move on. Trying to put the blame on someone else prevents you from growing as a player. Congratulating the opposing team on a win is a great way to show that you are a good sport. Ending the game on a high note regardless of who won emphasizes the joy you gain by participating in a positive way on your team. Cheating is not the way a good sport goes about winning a game. If you cheat and get caught it will reflect badly on not just you, but your team as well. Even if you do end up winning by doing something unfair, a win that was gained by cheating will feel hollow and unsatisfying. You might not feel like playing every time you show up for a game. You could be tired or just plain don’t feel like it. It’s important that you help your teammates out and put all of your effort into the game. Even if you’re losing the game by a large number of points you still need to get out there and play. You can learn a lot by playing a team that has more experience than you. Arguing with the officials is going to get you nowhere other than possibly thrown out of the game. If the call is in dispute allow your coach to discuss it with the official. Regardless of how it ends up, you will need to accept the result whether you agree with it or not. Ask your coach to clarify the decision for you after the game is over. Encouraging your fellow teammates whether they made an awesome play or made a mistake is a great way to display solidarity with your team. Show a united front to your competition! Setting a good example for your kids is one of the biggest ways that you as a parent can teach good sportsmanship. Yelling at a ref or a coach from the sidelines is not only really embarrassing for kids, but it also sets the wrong tone for dealing with real or perceived injustices. Encourage your kids whether they win or lose. If they made a mistake and are being hard on themselves, point out something that they did right in the game. The goal should be to have fun and make some lasting friendships. 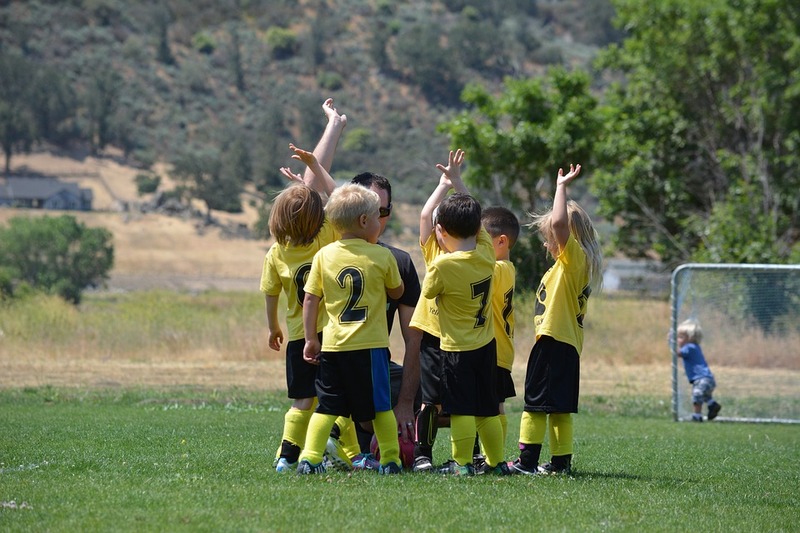 Your kids are exerting a lot of energy when they are out on the soccer field. It’s important to refuel them with the right snacks. Soccer snacks should be easy, healthy, and handy. There’s no reason to sacrifice nutrition for convenience. While there are many prepackaged snacks that are really convenient for busy families, they are typically lacking any real nutritional value. We’ve put together some healthy options that won’t feel like a full-time job to put together. Don’t forget to check for allergies before passing out soccer snacks to kids. How could we write a blog post about soccer snacks and not mention orange slices? Everyone remembers being on the soccer field with their cute orange slice smiles! Plus oranges are a healthy snack that almost everyone enjoys. Here’s a tip for easy orange slicing from the Don’t Panic Mom blog. 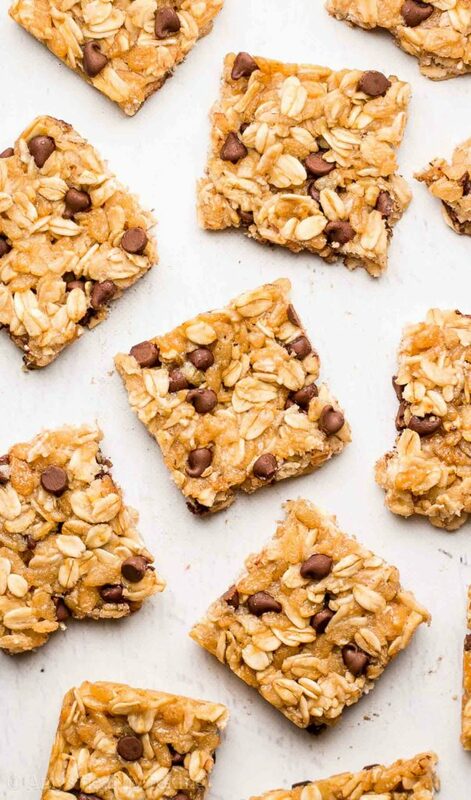 These healthy treats are loaded with chocolate and sure to be a hit! Recipe from Amy’s Healthy Baking. 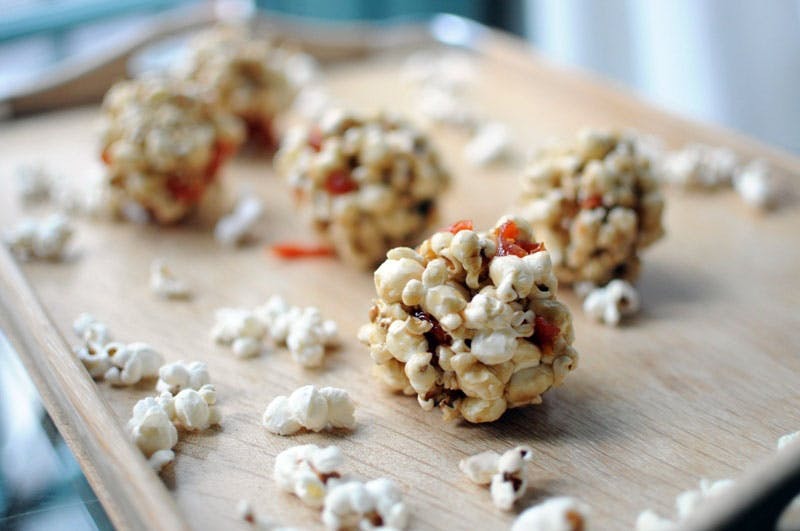 These tasty bite-sized popcorn balls are extra special filled with caramel, apricots, peanut butter and chocolate chips. Choose other variations to mix it up! Recipe from Brit + Co. 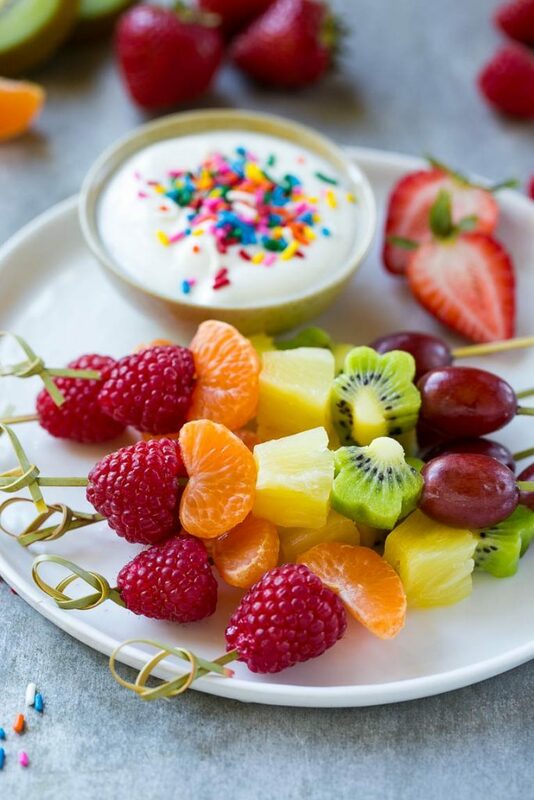 These are not only healthy, but most kids love fruit! These are guaranteed to be a favorite soccer snack. To make them extra special choose fruits in your soccer team’s colors! You could also try adding cheese to them. Recipe from Dinner at the Zoo. These yummy little bites are great for on the go! 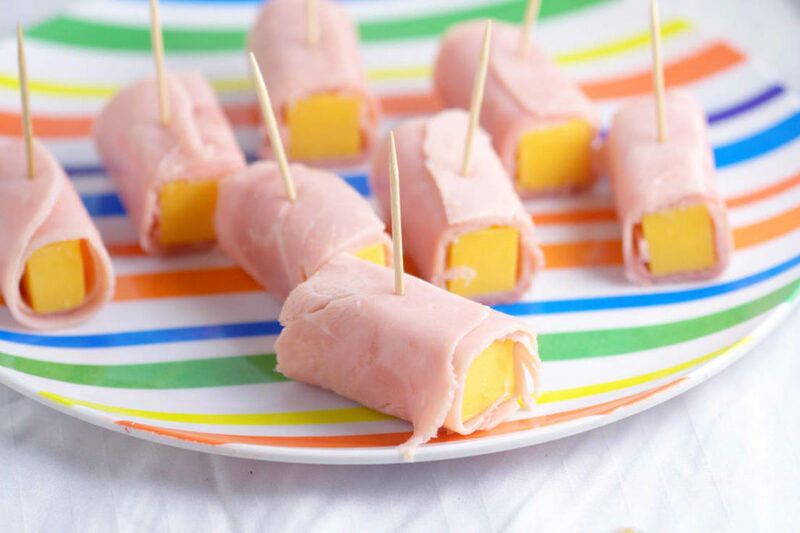 Use ham or turkey and simply wrap it around string cheese! Recipe from The Gracious Wife. To make this healthier you could add a little yogurt to the Nutella, or sub almond butter or a sugar-free jam. Recipe from Kidspot. This tasty and pretty treat will be a hit with your soccer team! You can make different variations with whatever fruits are fresh at the time. 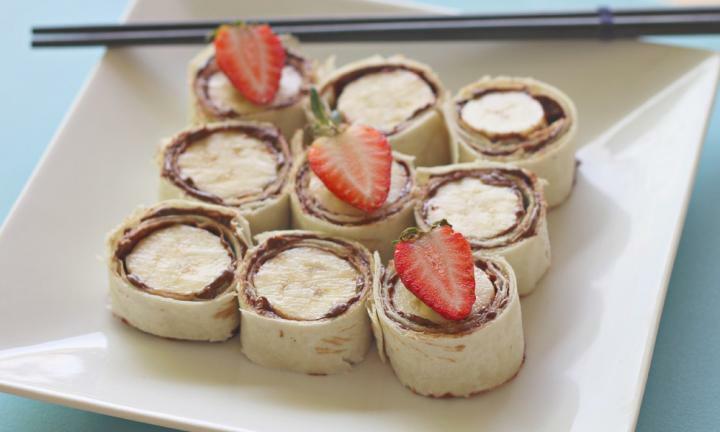 This is also a great soccer snack that your little one can help you make! Recipe from Courtney’s Sweets. 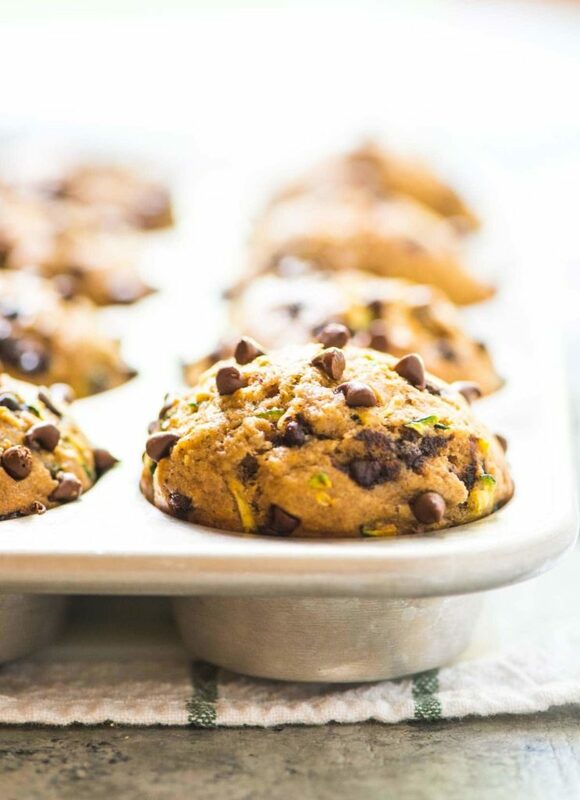 These easy muffins take just 15 minutes to prepare! 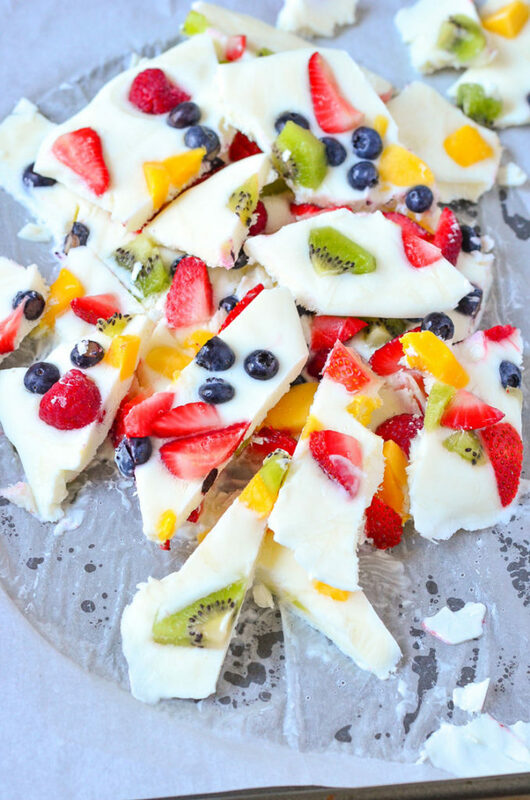 Make a couple of batches and freeze them for a quick and healthy soccer team snack! Recipe from Well Plated. 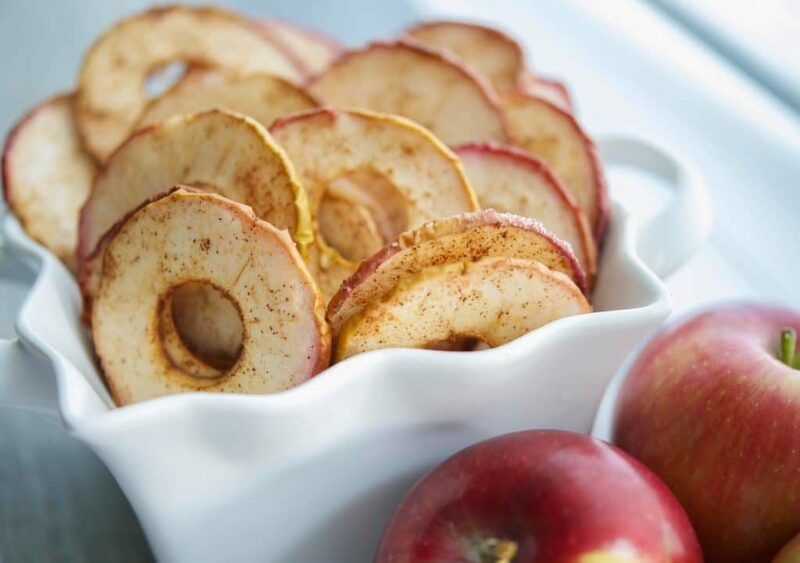 This is a delicious choice for the perfect fall soccer snack! Super easy to make and good for kids with allergies, since there are hardly any ingredients! Recipe from Carrie’s Experimental Kitchen. 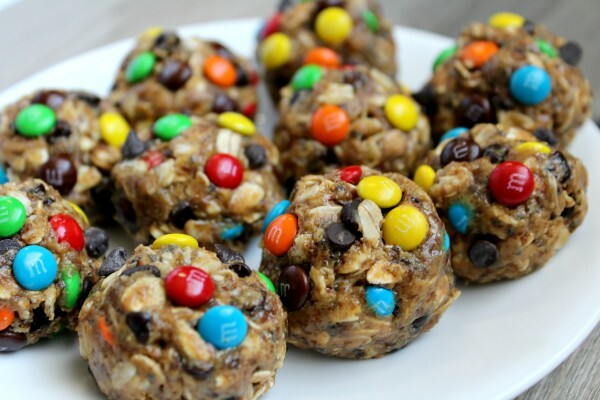 Little will they know that not only are these healthy soccer snacks filled with M&M’s but they are also full of good for you ingredients like chia seed and flax seed. Recipe from Love To Be in the Kitchen. We hope you have found some great new soccer snacks that will be a hit with your team! Why Buy High School Apparel? Creating a unified look with high school apparel for students can be a great way to boost school spirit at pep rallies, sporting events, and other student activities. When you have a group of students all in the same spirit wear it creates a sense of community. Whether you’re a fan, parent, student, teacher, athlete, PTA, or alumni you’re able to show your pride in the school or team with custom high school apparel and sports apparel. Get students in the spirit by hosting a contest at your school for who has the most spirit! They can order everything they need from the school’s free online custom apparel store. Add some face paint and have some fun! Another idea to get budding graphic designers in the spirit is to hold a contest to design the logo that will be used on the high school apparel. Just make sure to choose a clean design and upload the original vector file or transparent PNG. Don’t worry, if you need help with your artwork we are happy to assist! A great prize idea could be that the winner gets their choice of custom high school apparel from your store. A fun contest idea could also be to have students make posters to promote your high school apparel store. Have the students vote on their favorite poster and the winner gets a prize. We make it easy to choose and customize just what you’d like! If there isn’t already a high school apparel store setup for your school you can set up your own store in just minutes. Upload your school or team logo and you’re ready to go. To see ideas on promoting your store, check out this blog post next. Raising money is an important part of supporting your organization. A lot of times teams, clubs, schools, and church groups rely on fundraising to operate. There are a lot of different ways that you can try to earn money for your group. 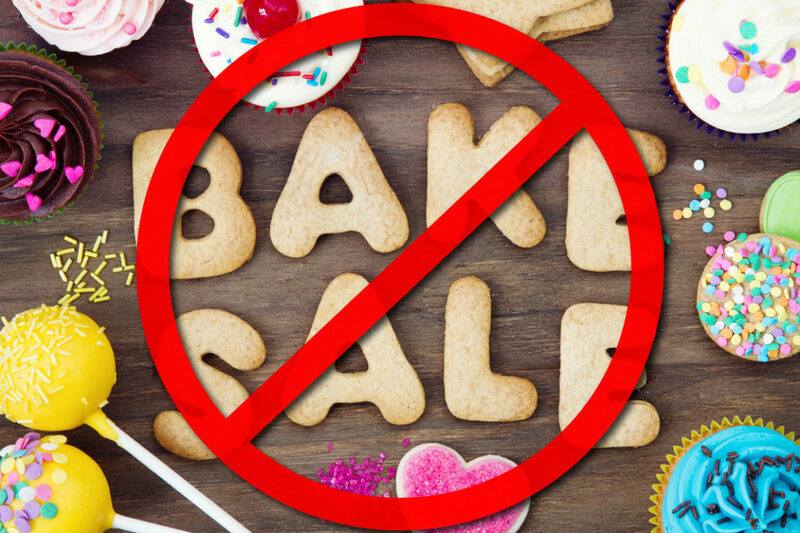 The good old-fashioned bake sale comes to mind, but people are busy and a lot of times families simply don’t have time to deal with such a time-consuming commitment for what is probably not a very profitable return. The days of sending your kids off to sell candy bars door-to-door are long gone and far too dangerous of an option. Apparel sales are often a lucrative way to earn money, but typically that option comes at a price. Someone has to be in charge of gathering everyone’s orders, sizes, and money. That person has to place the order and then round everyone up to distribute the gear once it arrives. It is a huge hassle for that person and often ends up very disorganized. Sometimes organizations will try to stock some custom apparel to sell. But how do you know what sizes to order? How many of each? Which will be the most popular? Not only that, but they will often be investing in that inventory for quite some time before it sells which ties up that money that is probably needed elsewhere. SSA Stores has come up with a solution to take the hassle out of fundraising with absolutely no risk and no inventory to stock. The best part is that your online custom apparel store is totally free to set up and only takes a few minutes. You can even upload your own logo and choose your own colors. We take care of everything! The members of your organization can simply go online to your custom apparel store and place an order for the items that they’d like. We will process the orders and ship them right to the customers! So where does the fundraising part come in? We will give you 12% back on all sales that are made in your store! The more you promote your store, the more money that you will earn for your group. 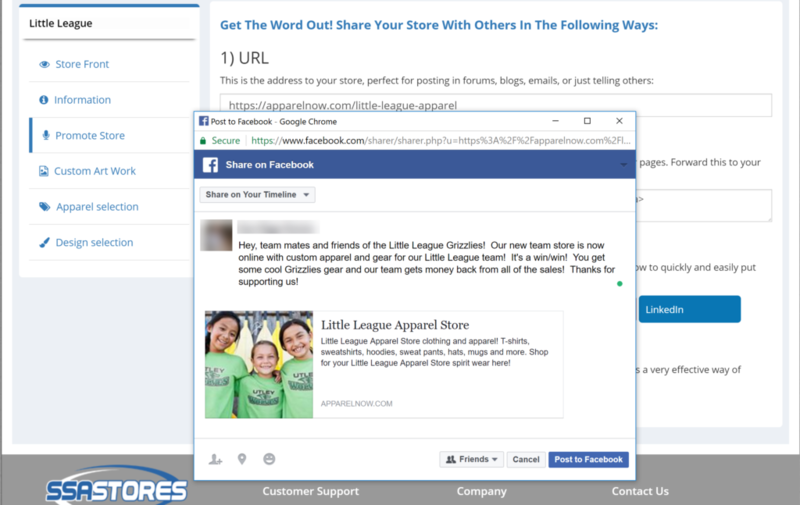 We make it easy to promote your store with custom banners, links, and social media sharing options right in the dashboard of your store. CLICK HERE for our detailed blog post on how to promote your store effectively. In addition to those promotional methods, you can also include the link to your online store in printed material your organization distributes. For example a printed newsletter, flyer, or church bulletin. You could also hang up posters around your school, church, etc. If you have a list of alumni and are promoting your new online school store, or even a class reunion sending an email to them could generate a lot of sales. Make sure that you (the organizer) order from your new online custom apparel store right away. When people see how great your custom shirt, hat, jacket, etc looks they will be more enticed to order. You could also order a couple of samples to have displayed in the office of your school, church, or organization. If you’re promoting a school spirit store, then at the beginning of the school year is the ideal time to promote your store. Make sure if your logo changes that you update your store. Setting up your free online custom apparel store is probably one of the easiest and most profitable ways to earn money for your organization. We want you to succeed! If you need any help setting up your store or promoting it we are here to help. We are so glad that you decided to choose us for your online custom apparel store! Properly promoting your store will ensure that you get the maximum cash back for your organization. We offer a host of online promotional tools to help you promote your store. There are several powerful ways that you can promote your store. Let’s get started! Login into your store https://ssastores.com/ to access links, banners, and share buttons as seen below and you can get familiar with how to promote your store. Once you’re logged in, you’ll be taken to your dashboard. This is where you can make changes to your store and access reports. Click on the “PROMOTE” link on the left menu. This will take you to the sharing options. We will go over each one. This URL link will take people directly to your store. You can copy and paste the link into an email that you can send promoting your store. You can also post this link in online forums or blogs. This is a quick and easy way to promote your store. Especially if you have an email list of all your team members or potential customers. 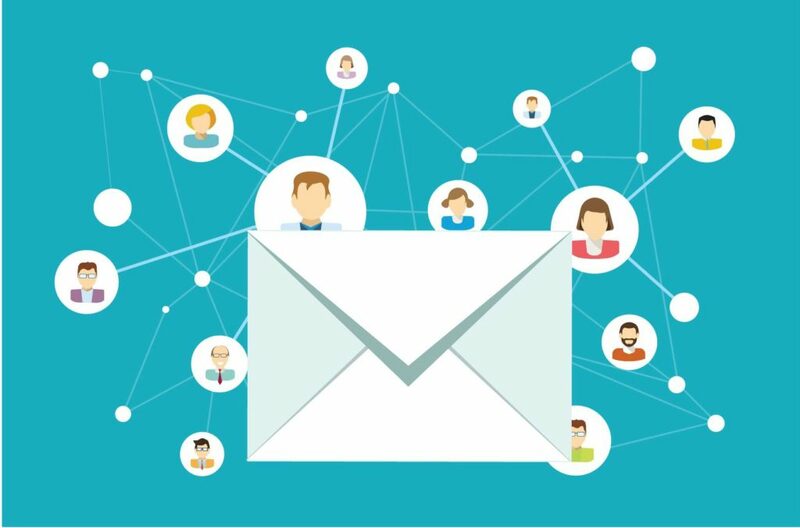 Creating an attractive email that promotes what your store offers as well as the fundraising aspect is a very effective way to generate more sales. You can also send out reminder emails to your list. Copy and paste this text link into your website HTML code for a clickable link on your website. This is a great way to always make sure that people who are visiting your organization’s website are also able to find your store. Share on one of the social media sites shown above by clicking on the button. This will bring up a box that you can customize your text in before posting. Make sure that your text reflects that your organization will be receiving a percentage of the sales back. If you’re friends with people who are part of your organization tag them in your post so they don’t miss it! Sample text for Little League Grizzlies: Hey, teammates and friends of the Little League Grizzlies! 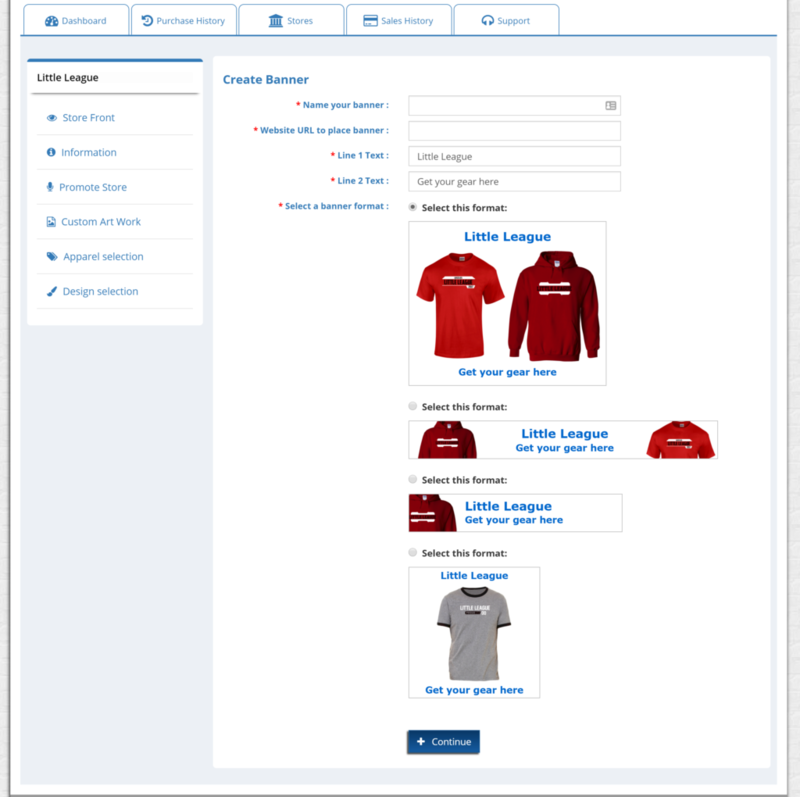 Our new team store is now online with custom apparel and gear for our Little League team! It’s a win/win! You get some cool Grizzlies gear and our team gets money back from all of the sales! Thanks for supporting us! We want your store to succeed, so if you need any help with promotion please don’t hesitate to reach out! © Copyright 2017 ApparelNow Online Stores. All rights reserved.